In a magical four-day period in autumn 2015, both of Texas’s NFL teams played at home on different days, a major high school rivalry was set for Friday night in West Texas, and a fierce regional rivalry came to the Cotton Bowl on Saturday afternoon. Pigskin Rapture: Four Days in the Life of Texas Football captures not just the action on the field but, perhaps more importantly, the pageantry off the field as well: cheerleaders, tailgate parties, booster club rallies, homecoming coronations, skybox parties, the bar scene, and more. Sports journalist Mac Engel and photographer Ron Jenkins and his assistant Michael Ainsworth took the ultimate football road trip: from a Texan’s game in Houston, to Odessa to cover Permian High School’s homecoming game, then to Dallas take in Texas v. Oklahoma in the Cotton Bowl, followed by every Texan’s Sunday ritual, the Dallas Cowboys at home against perhaps the best quarterback in a generation. Along the way the Pigskin Rapture team captures the sights, sounds, and smells of a state smitten with football, from K-D’s Barbecue in Midland, to the rarefied air of Cowboys owner Jerry Jones’s private box in AT & T Stadium. Here, too, are the more subtle and occasionally unseen manifestations of Texas football culture, such as a homeless man who resides on a practice field in Houston; the cavernous remains of the Astrodome; the proud high school where Andrew Luck played; the Australian woman who made the Cowboy s cheerleading squad, having never watched an NFL game; and the hangover a West Texas town continues to endure nearly three decades following the publication of Friday Night Lights. With hundreds of stunning full-color photographs and meticulous reporting on the games and events, this book provides both die-hard and casual football fans everything they need to feel part of the action! Though I may not live in Texas, Texas football was a part of my life growing up. My dad was a huge Dallas Cowboy’s fan back in the days of coach Tom Landry. Back in those days families only had one television, so when dad’s watched sports, their little girls usually watched sports too…at least this little girl and her sisters did. I remember my dad loving the Cowboys and hating the Steelers. We cheered for the Browns too of course. I mean if you’re from NE Ohio, you’re a Browns fan through thick and thin (usually thin). I can only imagine living in Texas with the Texas football fans. I’m sure you’ve heard of Friday Night Lights. That IS football in Texas. Texans live and breathe football, and this book takes you on a vivid four day journey of Texas football. With its gorgeous photographs and the game-like layout, Pigskin Rapture takes you on ride that is football. You’ll feel like you are right there on the field, in the locker room, cheering with the fans. Though it is not just one story, or one game, it is a cohesive look at the game. 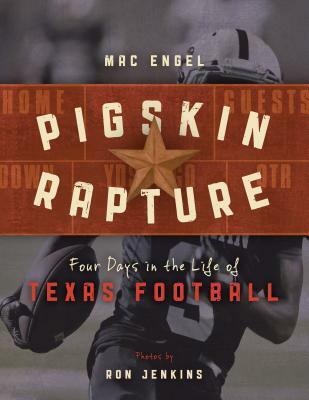 If you have a football fan in your life, they will love Pigskin Rapture. Be sure to come back Dec. 1 for a giveaway of this book along with 3 other books!